The most significant thing about cat’s and dog’s teeth is that they can not chew-they can gnaw or slice, but they can not chew. This is because their pointed teeth interlock when the mouth closes and prevents sideways movement of the jaws. This is why dogs are compelled to wolf their food down. As a result, the teeth of cats and dogs deteriorate throughout their life because they never really get to use their teeth for which they are designed-hunting and fighting. Their teeth are designed to catch prey and slice it up, or to fight off rivals. Since they don’t spend a lot of time hunting and fighting when we are looking after them, we have to give their teeth extra attention in order to preserve them. Some people advocate brushing their pet’s teeth daily and also giving them things to gnaw on. 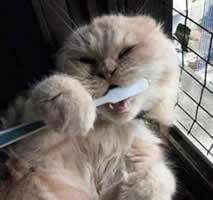 However most of us have a life and don’t have an inclination to brush our pet’s teeth. Furthermore dogs often get bored gnawing on the chew toys. Cats wouldn’t even let you countenance these remedies. So from time to time, their teeth need to be attended to with the same equipment that dentists use on us -Ultrasonic scalers and low speed polishers. 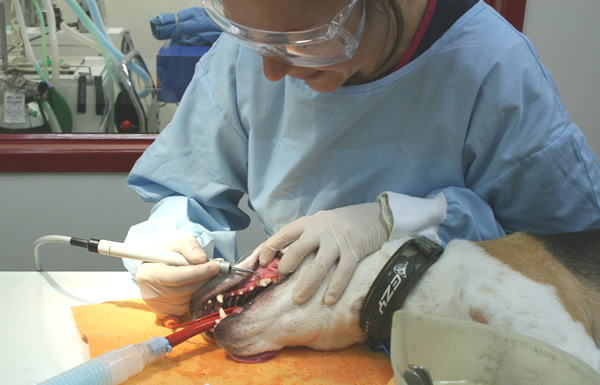 They love dentistry about as much as we do, so the procedure needs to be done under a general anaesthetic. How often, depends on the health of the individual animal. Some need it every year and some twice in their life time. Most dental treatments involve ultrasonic scaling to remove plaque and calculus from the teeth followed by charting, which is a process that measures the depth of any pockets around the teeth roots. Deep pockets, if they exist, indicate the presence of some degree of periodontal disease wherein some of the supporting bone may have been lost or the tiny ligaments that secure the teeth in their sockets have broken down. The teeth are checked for soundness, fractures, cracks, laxity, etc. If all is okay, teeth are then polished to make it more difficult for bacteria to adhere to their surfaces, followed by a rinse. Teeth that are not sound are treated accordingly. Many times this means extraction of a tooth that is loose, abscessed, fractured (especially if there is exposure of the pulp canal, which can give bacteria access to the tooth root), or, in the case of cats, a cavity is present. Some teeth that have pockets that are not too deep and have mild gingival recession are candidates for root planing, in which the exposed portion of the root is scraped to remove food particles, plaque, hair, etc. and treated with a topical antibiotic product to promote reattachment of the gingiva. Cats are a special case: They have cells called odontoclasts that, for reasons not totally understood, break down the enamel of teeth at the gum line, etching out a hole that appears as a red spot on your cat’s tooth. These lesions can be painful, as evidenced when this spot is probed with a cotton bud; the cat will jerk the lower jaw in pain. Many cats continue to eat normally despite having several of these lesions present – again because they are not true chewers of food and easily swallow without mastication. Over time, the erosion will continue and the crown of the tooth will crack off, leaving the stump. The gingiva [gum] will eventually grow over the area to protect it and the roots remaining will be reabsorbed. In some cases the gingiva will form a collar around the tooth, covering the defect before the crown has broken off. The only treatment available is extraction; these lesions cannot be filled, as they are not true “cavities”. Pain control is very important for all of these procedures and we employ dental nerve blocks along with preoperative and postoperative pain medications.